With more than 2 in 3 adults and one-third of all children in the United States qualifying as being overweight or obese, stubborn belly fat has become a major health concern that affects people of both genders and practically all age groups. Fructose has been blamed for contributing to this epidemic -- more than 10 percent of the average American’s daily calories come from fructose, according to the National Health and Nutrition Examination Survey. Fruit, a natural source of fructose, has been vilified by some in the process. While fruit is generally healthy, there are a few kinds of processed fruit you should limit or avoid when you’re trying to lose weight. Although the amount of fructose in a serving of fresh fruit is a fraction of what you’d get from a sugary beverage or a rich dessert, fresh fruit that’s been preserved in sugar is another story. Such fruit is typically kept in the center aisles of the grocery store, where you can typically find canned or bottled fruit cocktails, peaches, apricots, pineapple, mangoes, pears, cherries and mandarin oranges. While some of these fruits are packed in water, many are packed in light or heavy syrup or even sugary gelatin, which can greatly increase their sugar content. 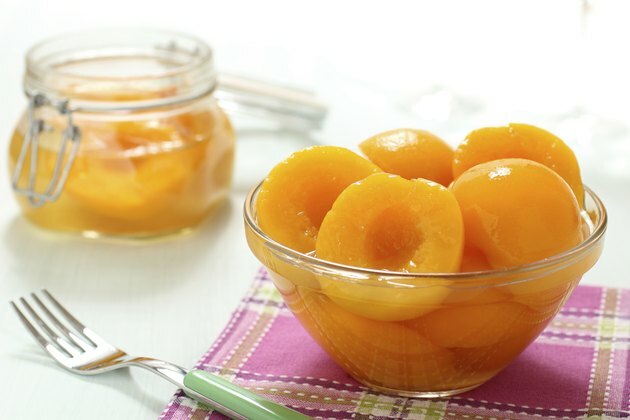 For example, you’ll get just under 13 grams of sugar from a cup of fresh peach slices, whereas a cup of peach slices preserved in heavy syrup provides almost 33 grams of sugar. The fiber in whole fruit helps control the rate at which your body absorbs its natural sugars, which is part of what makes whole fruit a healthy choice, despite its fructose content. When fruit is stripped of its fiber, as it is when it’s juiced, not only does your body absorb its sugar faster, but there’s more sugar to absorb. It can take several pieces of fruit to make one glass of fruit juice, which is what makes juice a more concentrated source of sugar. So even though the U.S. Department of Agriculture counts a cup of 100-percent fruit juice as a serving of fruit, it’s not the best option when you’re trying to lose weight. One cup of unsweetened grape juice has 150 calories and 36 grams of sugar, while a cup of seedless grapes has 100 calories and 23 grams of sugar. Blended fruit drinks, or smoothies, are sometimes perceived as healthier than juice because they aren’t pressed and filtered; instead, they’re pulverized. While this does mean that many smoothies offer some amount of fiber, it’s less than what you would have gotten from the whole fruits that went into the beverage, and some of it is not of the same quality -- pulverizing insoluble fiber changes its structure and affects the way it behaves in your digestive tract, according to a 2012 review on dietary fiber published in the Journal of Food Science and Technology. Many commercially produced fruit smoothies pack a lot of fruit into a single serving, which means you’ll ingest a lot of calories and sugar when you drink them -- an 8-ounce serving of one commercially produced mango smoothie provides 150 calories, 30 grams of sugar and no dietary fiber. Dried fruit has something in common with fruit juice – it takes the calories and sugar of whole fruit and concentrates it. A big problem with dried fruit is that many varieties are processed with added sugars. Blueberries are a prime example – you’ll get about 130 calories and 27 grams of sugar from 1/4 cup of dried, sweetened blueberries, whereas a cup of fresh blueberries has just 80 calories and less than 15 grams of sugar. Although unsweetened dried fruit has a leg up on juice -- it retains most of its nutrients and fiber, which also become highly concentrated -- its compact package makes overindulgence more likely. If you can avoid sweetened dried fruit and keep yourself to a single serving of dried fruit -- which is about 1/4 cup, in most cases -- you’ll actually get about the same level of nutrients as you would from a single serving of the same fresh fruit. The various processed fruit-based snacks aimed at children aren’t all that healthy and certainly won’t help your waistline. Even products that are all-natural, contain no added sugars and claim to count toward your fruit intake aren’t nearly as good for you as the real thing -- they’re typically made from concentrated fruit puree, which means they often contain little or no fiber. They also tend to contain fewer vitamins and minerals than their source fruits. Fruit-based snacks include fruit chews, fruit strips and fruit leathers. A large fruit leather has about 80 calories, more than 10 grams of sugar and no dietary fiber. When it comes to weight loss and weight management, fresh fruit has a lot to offer -- it’s nutrient-dense, relatively low in calories and rich in dietary fiber. Its natural sweetness is a healthy alternative when you want to satisfy your cravings for baked goods and other sugary food products. Eating fruit probably isn’t what caused you to gain belly fat in the first place, and eliminating the high-calorie, low-nutrient foods that more likely did -- in addition to getting more active -- would help you reach your goals more readily than would avoiding most kinds of fruit. If You Are Trying to Lose Weight, Should You Drink Fruit Juice at Night? Does Prune Juice Help You Lose Weight? Can Consuming Apples or Apple Juice Cause Diarrhea?